Over time, the Library grew so much that the Library Board voted to create a larger space. 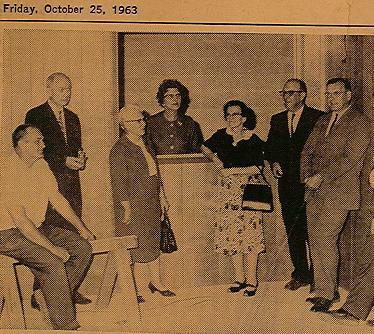 The photo to the right shows (from left to right) Harold Toombs, president of the Friends of the Library; Ralph Broughman, board member; Mrs. Abbott, board vice-president; Mrs. Stahl, librarian; Lena Drake, board secretary; H.J. Jack Smith, board president; Jessee Andrew, board tresurer; and Merrill Jones, engineer for the library project. A new library building was built on land from the Old City Park that was provided by the City of Greenwood and the Parks and Recreation Department. This new building cost $119,030 to build, housed 16,500 volumes and served more than 3,000 patrons in the Greenwood community. 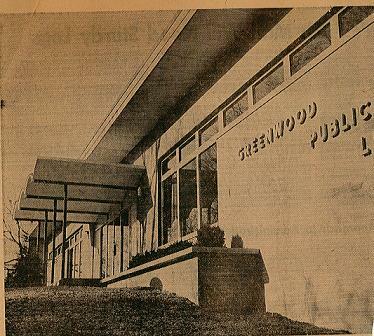 In the February 1963 edition of The Greenwood Clarion, the official publication of the Greenwood Chamber of Commerce, the Greenwood Library News appeared. 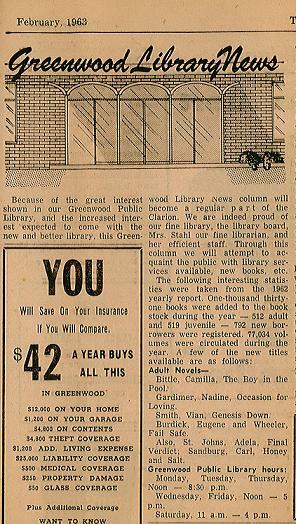 As the section stated, "Because of the great interest shown in our Greenwood Public Library, and the increased interest expected to come with the new and better library, this Greenwood Library News column will become a regular part of the Clarion. The Greenwood Library News column updated the Greenwood community about library activities, statistics, and new titles added to the library.